Dads are doing more housework and child care; moms more paid work outside the home. Neither has overtaken the other in their “traditional” realms, but their roles are converging, and both are feeling equally stressed about balancing it all. 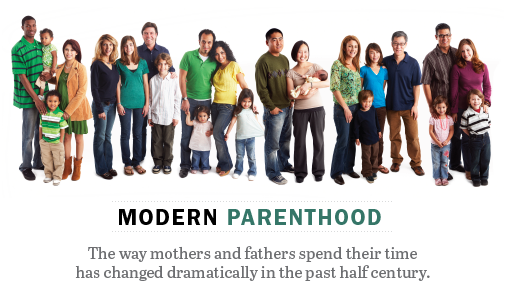 Our new study on Modern Parenthood explores how the roles of moms and dads converge as they balance work and family. 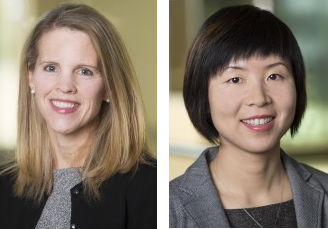 Kim Parker, associate director of the Pew Research Center’s Social & Demographic Trends Project, and Wendy Wang, research associate, were authors of the study. They discussed it on March 15, 2013 with readers. Welcome everyone! Researchers Kim Parker and Wendy Wang are here to answer your questions about our Modern Parenthood report. Wendy Wang: Hi everyone, Kim and I are looking forward to chatting with you about the parenthood and time use report. Kim Parker: Hi I’m Kim Parker. I just got here and am excited to talk with you all. Eve Tahmincioglu: One of our researchers at Families and Work Institute wondered why the survey asked how much mothers should work to benefit their children but it doesn’t ask how much fathers should work? The implicit assumption is men should work full time. Kim Parker: Thanks for your question. We did not ask what’s best for children in terms of their father’s work status. We often ask questions that have been asked in the past so we can see how attitudes have changed, and most past surveys have concentrated on mother’s work status. It’s definitely something worth exploring in future surveys. Jerri Lynn Hogg: How do feel technology has played a role in the change? Wendy Wang: Great question. We mentioned technology briefly in the report, about how it may have contributed to the decline of housework time since the 60s, such as wider use of household appliances, washing machines, dryers, and dishwashers. Kim Parker: For those interested in learning more about dads and how they are balancing work and family these days, here’s a link to a great article that appeared in the Washington Post yesterday focused on dads and based on our findings. Stephen Lazarus: I’m an American living in Canada. I have appreciated the family supports here that are in place to promote parental investment in time at home (generous maternity/paternity leave policies, benefits etc). What is the emerging edge on this in the US –what policy proposals seem most promising with a realistic chance of enactment in law? Kim Parker: This is an important topic, but we did not explore any policy options in our survey. Hopefully our research on public attitudes will help inform the policy discussion that may follow. Michael Harman: As far as rating themselves on doing a good job as parents, overall has that number increased or decreased in comparison with previous survey results? I understand that may be a bit of a broad question! Kim Parker: We haven’t been tracking this for very long, but the ratings haven’t changed substantially in recent years. In 2010, the share of parents that gave themselves high ratings was nearly identical to what we found this year. Other survey organizations may have asked similar questions with longer-term trends. Here’s some more analysis of the report from U.S. News & World Report . Simon Hedlin Larsson: What does longitudinal data suggest regarding a potential relationship between this “role convergence” and parents’ happiness/subjective well-being? Wendy Wang: We do not have the longitudinal data on this topic, but our current survey data shows that similar shares of fathers and mothers say that they always feel rushed, even to do the things they have to do. Kim Parker: Happiness is a tricky thing to measure, and it’s hard to pin down what variables are contributing to happiness and in what ways. There’s a fair bit of academic literature on this. Just last year a few studies came out saying that parents are happier than non-parents (and this is what our current research shows). Earlier research from the 1980s and early 1990s had shown that parents were less happy than non-parents. I’m not sure how the role convergence plays into this, but it’s a really interesting question. Simon Hedlin Larsson: Wendy, thank you for the answer! Would it be possible, based on the current survey data, to hypothesize that role convergence (both parents working full-time and dividing the domestic tasks less unequally) may lead to an increased feeling of stress? That both parents feel that they are spread too thin? Wendy Wang: That sounds like a great research question, I am interested in that as well. The problem is that the data on this is very limited. The recent American Time Use Survey has a well-being module. I might be able to link how much time they spend in different activities with some well-being indicators. But longitudinal data on this is tough to get. Gail O’Connor: I was interested to read that only 16 percent of all adults say having a mother who works full-time with a young child is ideal, when more women than ever said they are seeking full-time work: 32 percent now compared with 20 percent in 2007. How might you explain the disparity between the public’s view of mothers’ full-time work, and what women themselves want? Also, since the recession was given as a probable reason more women want to work full-time today than they did in 2007, just wondering: were women asked the reason? Did they cite other reasons for wanting full-time work? Kim Parker: That is an interesting finding, and there continues to be a disconnect between what mothers want (and need) and what society thinks is best for young children. I think the disparity in views is the source of a lot of the conflict that moms feel about working. I think this is one of the reasons why moms find part-time work so appealing. Unfortunately, the reality is that most working moms work full time. With regard to the recession, we didn’t ask women why a certain situation (working full time, working part time or not working at all) was ideal for them. However, we did see a correlation in the data between financial stress and the desire the work full time. The women who were in the most vulnerable financial situation (i.e. told us they didn’t have enough money to make ends meet) were among the most likely to say their ideal situation would be to work full time. Women who said they “live comfortably” were much less likely to say they prefer full-time work. Cha E. TY: Have you detected any regional differences in your research for this study? Wendy Wang: That is a great point, we didn’t look at parents’ time use or opinions by region, but it will be a nice follow up in the future. Don’t miss our parenting quiz. You can compare your results to the mothers and fathers we surveyed. Neelie M Neirbo: Not surprising, the dad perspective. Most men are now present at childbirth. Compared to the aging stumps on Capitol Hill and senior business leaders, today’s emerging dads must have vastly different expectations for workplace support. Kim Parker: You’re right that this generation of dads with young children has had a more hands-on experience with their kids, and our analysis of the time use data going back to 1965 shows that. The roles of moms and dads both at work and at home have converged quite a bit. Our survey didn’t explore the types of benefits or supports moms or dads have in the workplace. You might be interested in some of the work the Families and Work Institute has done. Wendy Wang: I did my dissertation on fathers’ time with children 5 years ago, I can see more people are interested in this topic than before…dads are very important in children’s lives, we need more research on it. Here’s some of our recent research on dads and a report about women’s growing role as breadwinners. Kim Parker: Thanks so much for all your great questions and thanks for your interest in our work. We will continue to do research on the topics of gender and work-life balance. Stay tuned for more reports! Wendy Wang: These are great questions, thank you again for joining us.